20a. [Winter carnival spectacle]. ICE PALACE. This is a super Minnesota sort of thing—St. Paul always puts on a winter carnival complete with ice palace. Ice … sounds good right about now. While today’s 90° will give way to 65° in Chicago tomorrow, I’m taking the 90s with me to D.C.
18a. [Handcuff], MANACLE. I assume a zillion puzzlers have noticed that MANACLE and MONOCLE are fraternal twins. 57a. [#MeToo ___] ERA. Nice clue. 45a. [Health care coverage providers? ], SCRUBS. Thank you, scrubs, for covering our health care workers’ bits. 4.25 stars from me. Hope to see some of you at the Indie 500. Don’t forget to bring your sturdiest pencils and erasers, because you will need them! I had GAhN/hEI. A different clue for REI, or GAHN to GOWN (changing AREA to OREO and ALLA to ARLO) would have made it solveable for me. Not sure if this will be a common pratfall, or if I will be an outlier today. This entry was posted in Daily Puzzles and tagged Andrew J. Ries, John Lampkin. Bookmark the permalink. NYT: One of my very favorite puzzles in recent memory. I took a moment to read the solved version after it was all done and essentially every entry is in plain English and some are fantabulous! TEACHABLE MOMENT crossing YOU CALLED IT and SPIDEY SENSE!!! And some lovely juxtapositions: CONNIVE over ROTTEN! SOOTHE next to HONEYS. I always enjoy Andrew’s puzzles and this one was a lovely example. If (like me) you prefer your smooth themelesses to be clued with a higher difficulty level, check out Andrew’s Freestyle puzzles. They’re SO good. The Spelling Bee words were the hardest they have ever been. Excellent puzzle. On the easy side for me with one exception. Aren’t togs clothes? I do not understand TROPHY as the answer to BALL TOGS. Ha Ha I did the Spelling Bee and I AM A GENIUS!! Also, IFNO doesn’t ring true for me. “If not” seems more idiomatic. I hated IFNO too, but I needed to finish packing and get to bed so I didn’t call it out in my post. Also vexing because a significant number of real words are not accepted. 71% (+/-1%) by my count. Apparently, the longest words in English that use 2 unique letters are 6 letters long. One of them is in today’s puzzle. And the longest using 7 different letters is 17 letters long (disinterestedness), and without an s, 15 letters long (e.g., nationalization, nonintervention). Be ready. Spelling Bee is vexing but would be a lot more vexing if we had to guess words like ankyloglossia. IFNO hung me up for a bit. Sounds like computer code. I didn’t like the obscure crossing names in the NYT and thus rated it lower than most of you folks. I’ll join the grousing about the surprisingly limited dictionary in the otherwise great Spelling Bee. I’m routinely being rejected on words that might not be in everyday conversation but are hardly arcane or obscure. The applet itself is very well done, and I’m pleased that it retains one’s place for later use on the same or another computer. I didn’t mean to start the Spelling Bee thread that I accidentally started. I was talking about the Scripps Howard Spelling Bee on ESPN last night. I taped it so as not to miss the NBA game. The winning word KOINONIA was one of the easier ones. I guess I’m having a bad week. 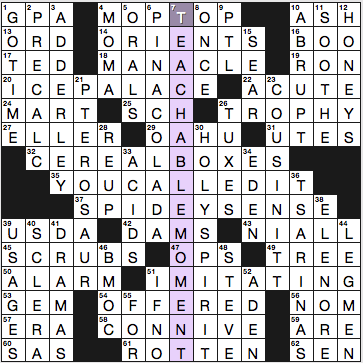 None of the NYT puzzles this week delighted me. On the plus side, they were all consistently fine (maybe except for Monday). Some great themes, long answers and clues all week long. But short, crosswordese fill is my nightmare as an inexperienced, ESL solver and my gods this week was full of them. Today’s short answers (as Mr. Ries himself stated in his notes) took a lot away from the joy of solving the brilliant center stack. Especially NW corner, with its ORD and ADDERLEY and… Not my thing. To sum up, another solid offering, but I’m still waiting for that “THIS MADE MY WEEK” puzzle. 3.45 stars. See you at The Indie 500. I forgot to pack my Kentucky Derby costume so I’ll probably be the least snazzy guy there. Nice LAT theme. Fun solve. Bwa ha ha yes! It has been a really good puzzle day. The LAT was super fun. What great clues. The NYT was fun and a delight until I hit the SE corner and was utterly humbled. TSARINAS and ELENORE crossed with NIALL and a three-French-word clue (I live in a United State where most of us take Japanese or Hawaiian in high school). But hey. Friday. 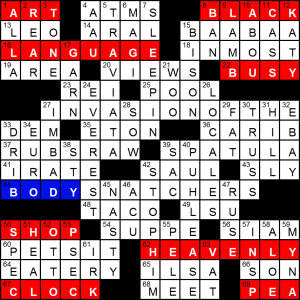 I get the feeling an equivalent clue using Japanese words would never be accepted by a crossword editor in this country, despite my suspicion that there are more Americans who speak Hawaiian or Japanese as a first (never mind second!) language than there are people who speak French as a first language. Gonna go sit on my LANAI in my KIMONO now. Louisiana wants a word. There are around 3 million French first language speakers in the States, which is fairly high.